4LOBE EVENTS DETROIT IS A BOUTIQUE SPECIAL EVENT COMPANY FOCUSING OUR PRODUCTS AND SERVICES ON THE CULINARY AND CULTURE OF DETROIT and the surrounding suburbs and cities. 4Lobe Events Detroit, in cooperation with local companies Taste Detroit Food Tours and Welcome Detroit Destination Management, develop innovative events and team building activities with the culinary and cultural expertise we have developed over the past decade. Our goal is to show your group Detroit's exciting food, drink and culture, through an array of critically acclaimed events. We provide value driven solutions created especially to maximize the experience regardless of budget. 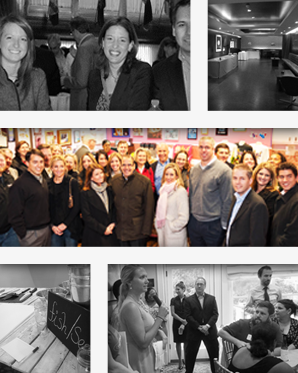 We run our events and team building activities in popular, hip neighborhoods throughout the Detroit metropolitan area, including Downtown, Midtown, and Eastern Market. From themed, multi-station receptions to hands on cooking challenges to exciting food tours, we work to combine the essence of the motor city and greater Michigan into everything we offer. Our goal is to ensure your group experiences a fully customized event, which both meets your needs and exceeds all expectations, throughout the process. 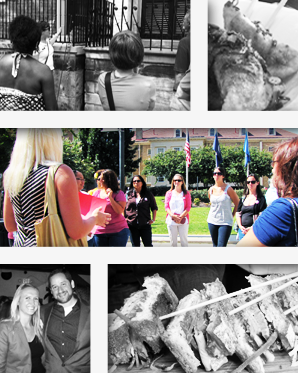 Over the past decade, we have developed hundreds of events and tours that can be modified for your group, or we can create something completely unique. We believe everything is better with food and drink. We work to bring together colleagues, classmates and relatives with an array of team building activities that incorporate food and drink into events. The 4Lobe team building activities are ideal for both small and large groups and can either incorporate meals, receptions, and happy hours. 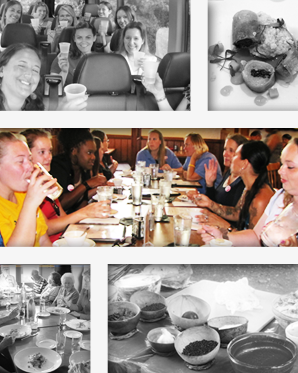 Incorporating food and drink into a traditional team building setting provides guests additional ways to work together, learn about each other and build camaraderie. Working in cooperation with our sister company Welcome Detroit Destination Management we can offer full service destination management support, including accommodation, logistics, meals, event planning, and transportation. Our signature series of team building activities bring together individuals into small teams with specific roles in order to create the best dish, dishes or drinks within established constraints within a particular timeframe. We utilize our mobile kitchen system to offer the events nearly anywhere in the Detroit metropolitan area and bring in our specially trained emcees alongside experts when needed as well. Groups then present to judges who award points based on certain criteria including creativity, taste, and design. 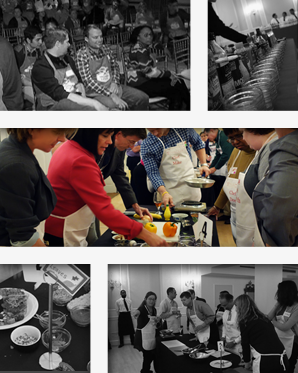 Our Culinary Challenge series offer options including Iron Chef, Chopped and Cupcake Wars inspired events. 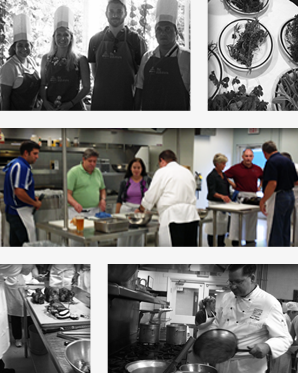 Work as a team or individually in our Cooking Classes. Featuring local instructors and chefs to take your group through the steps of preparing a fantastic meal or series of appetizers, based on your needs. The 4Lobe Mobile Kitchen system enables your group to enjoy a cooking class nearly anywhere. Whether experts, foodies, or even beginners we offer menus that are tailored to your needs. Our Cooking classes have various themes, featuring local Detroit and Michigan specialties as well as ethnic favorites (eg Italian, Thai and others). Imagine a scavenger hunt where your group not only seeks out historic parts of a neighborhood, but also great restaurants and fantastic samples of food and drink to enjoy and record. he revamped scavenger hunt offers the same great elements of the standard event, but is much more fun with food and drink combined. 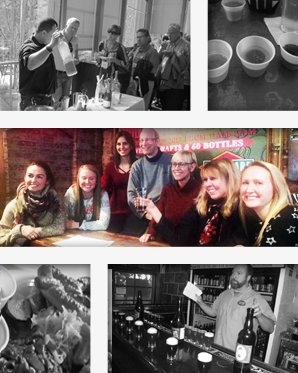 Take one of our culinary scavenger hunts in Eastern Market, Downtown, or Midtown Detroit. On request we can build culinary scavenger hunts elsewhere in the region. Visit three restaurants either within a neighborhood, or several throughout Detroit to enjoy a stop for an appetizer, a stop for a main course and a stop for dessert and a guided cultural, historic, and architectural tour between restaurants. Our progressive dinners can be by foot, motorcoach, limo, bus, or other form of transportation depending on the restaurants selected for your meal. You can choose specific themes based on the type of food each restaurant has to offer. Throughout a 3-3.5 hour period, enjoy one of our food tours, where a guide teaches you about the history, architecture, culture of a neighborhood while stopping typically at 4-5 restaurants for specially designed dishes or drinks. Choose from several neighborhoods throughout the city. A dine around is a customized version of a food tour, typically with fewer stops with several courses at each, as well as drink pairings. A Detroit Dine Around is ideal for corporate and non-corporate groups that are either larger or in need of a more customized experienced than can be provided by a standard food tour. The interactive dining event brings together parts of a food tour into a single venue. Stations are set up throughout the venue with specialties from around the city while great music, images, video and other thematic elements help to provide an interactive experience. Guides throughout the area provide guests with information and recount stories about highlighted areas.